The University of Chester has been making history since 1839, when it was founded by such pioneers as the great 19th-century prime ministers, William Gladstone and the Earl of Derby and a former Archbishop of Canterbury. University Centre Shrewsbury (UCS) opened in 2014, aiming to provide unprecedented opportunities for students in the local community. 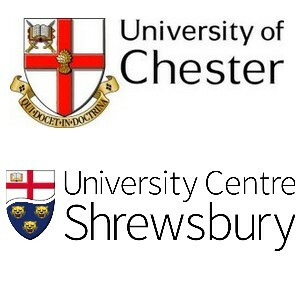 It is part of a partnership between The University of Chester and Shropshire Council, who are working in collaboration to deliver an exceptional Higher Education experience in Shrewsbury. We aim to be different to many other universities in the UK because, working alongside local and national business, courses are taught by high level practicing professionals with a renowned reputation for the quality of their work. This will help students become a different type of graduate; one that is highly employable, highly innovative and enterprising and who has a rounded and valuable student experience. Steven has considerable experience in many IT, technical support, programming and management roles in the private and public sectors. He has worked on several European projects and has developed graphics and web platforms as well as producing videos and music for them.